Brose Bamberg had complete control of the game against Bremerhaven and recorded their seventh straight win in the German League. 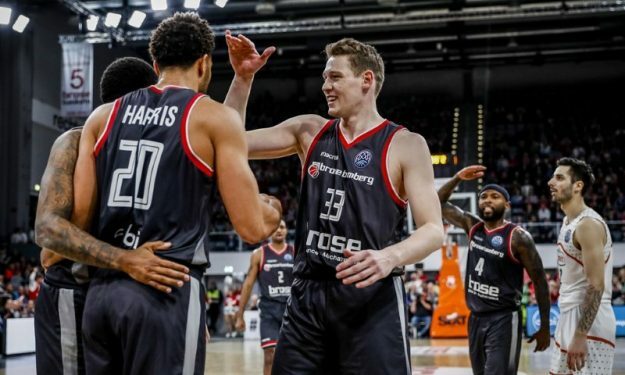 Brose Bamberg registered their tenth straight victory in all competitions, seventh in the German League, as they dominated Bremerhaven with a 100-74 home win on Day 24. All 12 players on the hosts’ roster got a chance to play and all of them scored with Cliff Alexander’s 19 points and nine boards leading the way followed by Arnoldas Kulboka’s 15 and Maurice Stuckey’s 14 points. For Bremerhaven, Keith Benson banked game-high 20 points and added nine rebounds while Durrell Summers scored 11 points. Bamberg improved to 17-5 staying comfortable in the playoff zone while Bremerhaven now holds a 4-20 record at the bottom of the standings. The first place belongs to Bayern Munich with 21-2 and Oldenburg follows with 19-4.